WildRace enables you to create and manage lists of waypoints in WildStar. A waypoint is a three-dimensional (x, y, z) coordinate within the world of WildStar. A waypoint can be in any home, zone, adventure, expedition, or dungeon in WildStar. A course is simply a list of waypoints. WildRace enables you to create waypoints and courses. The courses can be saved to a hierarchical database similar to a file system. The database is saved at the account level so that all of your characters on all of your realms can access all of your courses and waypoints. Courses can also be shared with other players who use WildRace. WildRace as a "Waypoint Manager"
When you are in a house, and you select a waypoint that is in another house in the same realm, then a "Visit Home" button on the tool bar will enable you to teleport directly to that house (similar to the "Visitor" and "Revisit" add-ons). WildRace was developed with racing in mind. Courses can be "run" as races. When run as a race, all the waypoints in the course must be visited for the race to be complete. Courses can be "Timed" similar to challenges. Courses can be "Strict" so that their waypoints must be visited in the exact order that they appear in the course, or they can be "Loose" so that their waypoints can be visited in any order. This version of WildRace is an early test version. It enables a player to edit, save, load, share, and run courses. Future versions will enable players to race against other players. Bring up a window About WildRace. Lock and unlock the window from being moved or resized. This window shows the "current" course. The current course is the course that can be run. Start or Stop a race using the current course. Visit Home of a player house. The home must be in the same realm and owned by a player of the same faction as you. Toggle Visible Waypoints. This enables you to quickly turn on or off the display of a marker (flag) and line (TrackMaster) to the selected waypoint in the game world. Open up the Options window. This enables you to set various WildRace options. Open up the Editor window. This enables the current course to be edited. Open up the Files window. This enables the current course to be saved, a saved course to be loaded as the current course, and various course and folder management. Open up the Share window. This enables the current course to transferred to another WildRace player. A red "No" circle-slash icon means that the waypoint is unreachable. This could be present because the waypoint is in a house on a different realm, or is in a zone that is faction specific. 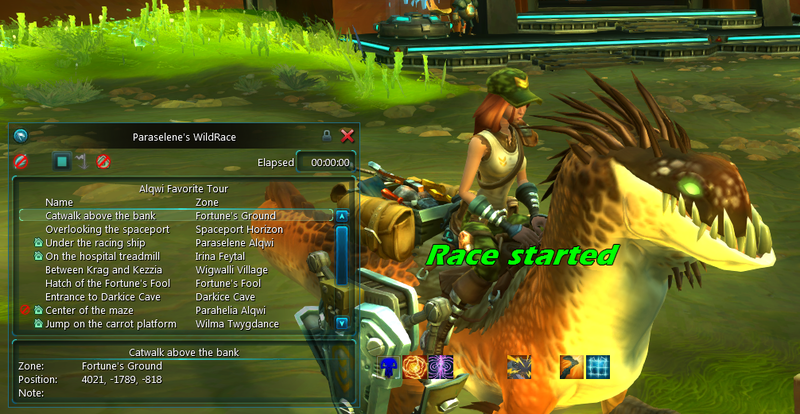 When a course is being run as a race, WildStar will automatically skip unreachable waypoints. A cyan "House" icon means that the waypoint is in a house. This panel shows the name, zone, and coordinates of the selected waypoint. This panel shows the race parameters (Strict, Loose, Timed) and the time elapsed or remaining. This enables you to set various WildRace options. Set background to either Holo (transparent) or Circuit (opaque). Use TrackMaster for Visible Waypoints. This window enables the current course to be edited. Create a New Course in the current course. Note: The current course will be "replaced", so make sure that you save it first if it contains unsaved modifications that you want saved. Add the current location to the course. Move the currently selected waypoint upward in the course. Move the currently selected waypoint downward in the course. Copy the currently selected waypoint into the clipboard. Paste the waypoint in the clipboard into the current course. This "inserts" the waypoint into the current course, and does not "replace" any existing waypoints. Delete the currently selected waypoint. Use with caution; there is no undelete. To rename a waypoint, select the waypoint and click on the waypoint's name in the waypoint details panel. Edit the name and hit the enter key to apply your changes, or the escape key to cancel your changes. To rename the current course, click on the course's name at the top of the waypoint list. Edit the name and hit the enter key to apply your changes, or the escape key to cancel your changes. Note: Both the Editor and Files windows have internal clipboards. They are two different unrelated clipboards, and neither one is your computer's clipboard. When racing, run the course in "Strict" order. When checked, the course's waypoints must be visited in the exact order that they appear in the course. When unchecked ("Loose"), the course's waypoints can be visited in any order. When racing, the course is timed or untimed. If timed, it must be completed within a specified time, similar to challenges. This window enables the current course to be saved, loaded, and for saved courses to be organized into folders. Load a copy of the selected course into the current course. Note: The current course will be "replaced", so make sure that you save it first if it contains unsaved modifications that you want saved. Save a copy of the current course into the selected folder. If a course is selected, then the current course is saved into the parent folder of the selected course. Create a new folder in the currently selected folder. If a course is selected, then the new folder is created in the parent folder of the selected course. Move the currently selected folder or course upward in its parent folder. Move the currently selected folder or course downward in its parent folder. Copy the currently selected folder or course into the clipboard. Paste the folder or course in the clipboard into the selected folder. If a course is selected, then the clipboard's folder or course is pasted into the parent folder of the selected course. This "inserts" the clipboard's folder or course into the selected folder, and does not "replace" any existing folders or courses. Delete the selected folder or course. Use with caution; there is no undelete. To rename the selected folder or course, select it. Its name will appear in the edit box. Edit the name in the edit box and hit the enter key to apply your changes, or the escape key to cancel your changes. Note: Unlike most file systems, names do not have to be unique between folders and courses in a given parent folder; they can be identical. This method avoids overwrites and annoying confirmation dialogs. Name your stuff wisely. Note: Both the Editor and Files windows have internal clipboards. They are two different clipboards, and neither one is your computer's clipboard. This window enables the current course to be shared with another player with WildRace installed. Send the current course to the selected player. Receive a course from another player. Note: The current course will be "replaced" by the received course, so make sure that you save your current course first if it contains unsaved modifications that you want saved. Note: Both the sending and receiving players must have their WildRace Share windows open during the transfer. Closing a Share window cancels the transfer. 1. Load the course that you wish to run as a race. 2. Press the green "Start" button on the tool bar. A message appears on the screen informing you that the race has started. The green "Start" button turns into a red "Stop" button. If the course is "Strict", a countdown time appears in the status bar. If the course is "Loose", the elapsed time appears in the status bar. The first reachable waypoint in the list is automatically selected, and its coordinates are shown in the details panel. 3. Travel to the waypoint. As waypoints are reached, a "reached" message is displayed. The waypoint in the list is marked with a green check mark. The selection in the list automatically advances to the next reachable waypoint. 4. When all the reachable waypoints in the list have been visited, the race is finished. A "finished" message appears, and the status bar timers are halted. Note: There is a different between the race being "finished" and "stopped". "Finished" means the race is still going, but you have completed it. The status bar timers are halted, but not reset. Green check marks are still present in the list. "Stopped" means that you have exited the race. The status bar timers are reset. Green check marks are cleared in the list. When racing against others, do not press the red "Stop" button until everyone has finished the race. Compare times to see who won. In future releases, WildRace will compare times automatically between race contestants. 5. To exit the race, press the red "Stop" button on the tool bar. A message appears on the screen informing you that the race has stopped. The status bar timers are reset. Green check marks are cleared in the list. The red "Stop" button turns into a green "Start" button, ready to run the race again. That's it. See you on Nexus.